An aerial view of the Caltragh taken from Bing Maps. 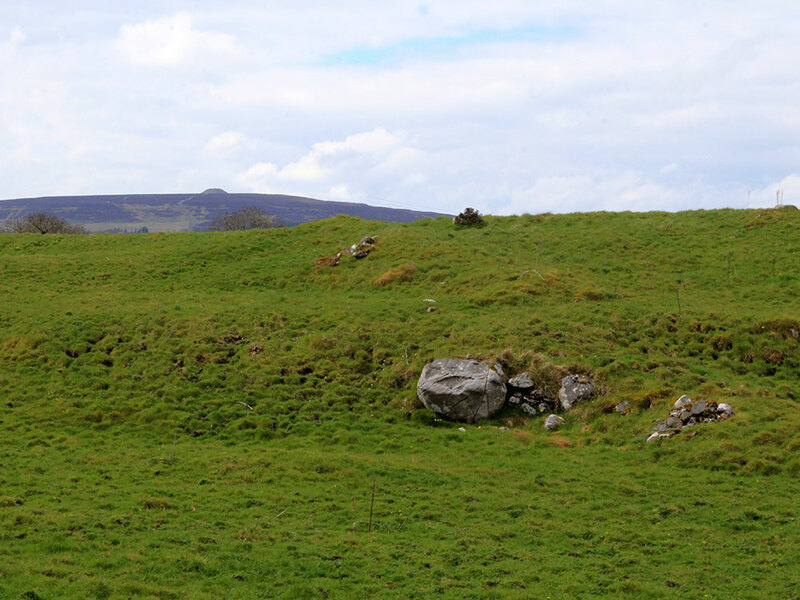 The large earthen monument is to the north east of Carrowmore, and would seem to be a bronze age burial site. No. 60. To the south of one of the roads leading from Sligo to Cloverhill, and east of that from Sligo to Seafield, N.E. of the oval chain of circles. "Known in the district by the name of Caltragh." Petrie here explains this term, as it was locally explained, no doubt, "the church or graveyard, from the fact that the whole of it is filled with human bones. No interment has ever been made in it in the memory of man, nor is there any tradition of a church ever having been there." 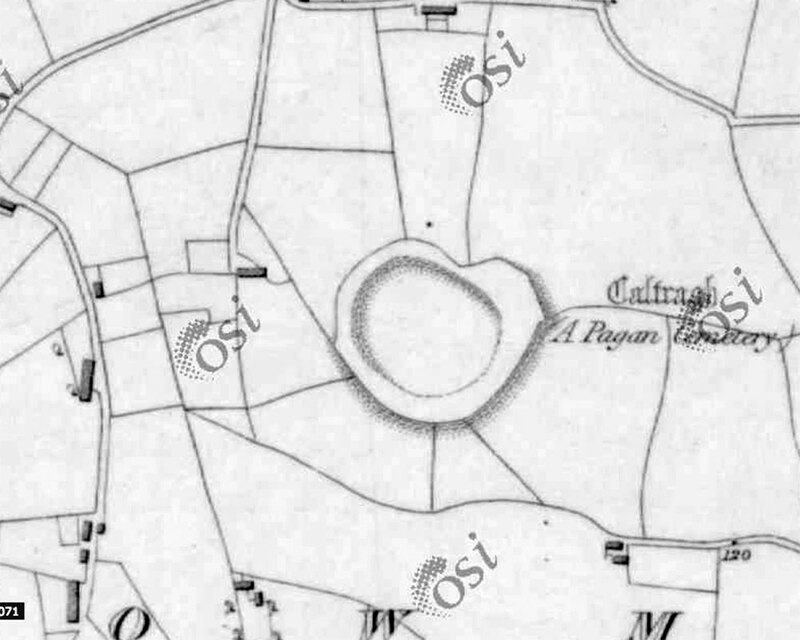 An 1837 map of the Caltragh taken from the OSI website. It is evidently a work of pagan times, and the conclusion may, perhaps, be drawn with safety, says Petrie, that, "while the other monuments were the tombs of chiefs or princes, this was the general cemetery of the soldiers or common people." 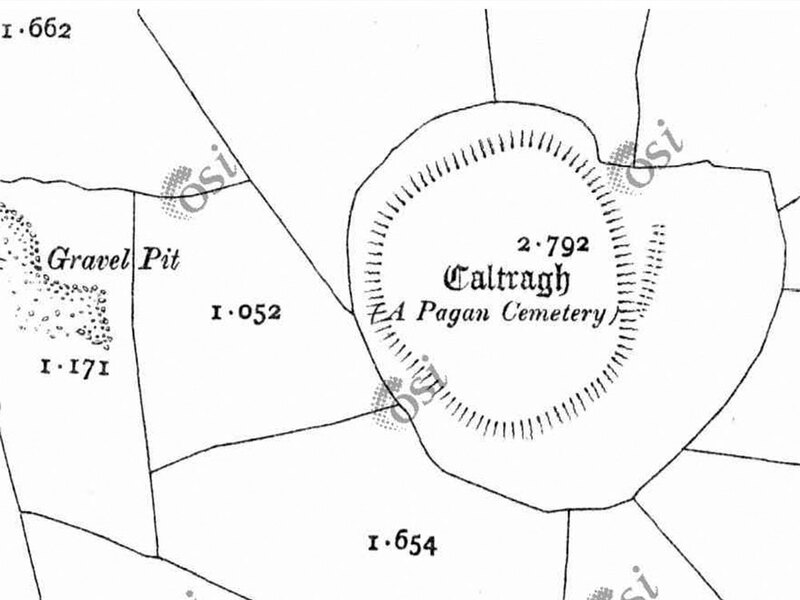 A 1911 map of the Caltragh taken from the OSI website. Col. Wood-Martin, in like manner, regards it as the general burying-ground for the ordinary population of the district, "as distinguished from the sepulchres within the circles, which would appear to be those of a family or of a chief." "It is a great, circular enclosure (92 paces in diameter from north to south, and about the same from east to west), originally surrounded, as in all the preceding examples, by a circle of large stones. Most of these stones have been removed to clear the land, and those which remain are nearly covered with earth." - Petrie. The view from the Caltragh to Knocknarea. "The interior forms a gently rising hillock...... Owing to the quantity of human remains turned up when the grassy surface was broken for tillage, it is stated to have been soon again laid down by the tenant, who imagined the crop of potatoes would be too oily in taste! It is an enlarged and developed reproduction of No. 8...... Some years ago part of the field outside the periphery of the caltragh was tilled, and is said to have been full of human remains. In one small spot in the slope of the hill, from which the sod had been stripped by cattle, fragments of calcined and uncalcined bones, periwinkle shells, a fragment of fractured white quartz, and animal teeth, both calcined and uncalcined, were picked up." - Wood-Martin.